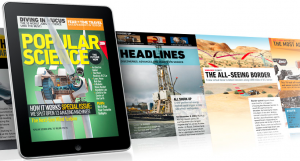 iPad media apps – the revenue solution for media publishers? The extremely sucessful iPad launch (3 million iPads sold in 80 days) has created a tremendous buzz and excitement in the media industry. I am certainly one of the very happy iPad owners. Many publishers see the iPad as a solution to their main headache: How can we charge for our media content when our web site users don’t want to pay for it and there is such an abundance of free content on internet? With the iPad, the argument goes, we can deliver an improved user experience that looks more like our print media but with some added features like video, then people will want to pay for it. But are we really seeing improved user experiences with the current iPad media apps? We are now seeing the first generation media apps from big publishers, like Bonnier’s Popular Science, Time magazine, Wired magazine, Washington Street Journal and many others. Many people react against paying for these apps, some with the rather strange argument “but there are ads in it, so I should’t have to pay for the app”, as if print media were ad-free. Well, that reaction of course stems from that we are so used to free media content on the web. But I don’t want to pay for media apps that I feel are giving me a worse experience than online media. I and many others also react against the walled garden of these apps, most of them are not connected to internet at all. We are suddenly back in the 90’s world of interactive CD-ROM media that looked great but were all one-way communication that could not be updated. The current breed of iPad media apps are using a multitude of different interface standards. Even basic functionalities get confusing when you don’t know how they work. We are used to reading articles in columns from top to bottom. This is the way all our printed media have always worked. Still, Washington Street Journal manages to introduce a horisontal article layout, it even has another column to the right of the story which hides the continued story to the right, making it difficult to find. This also forces them to repeat the headline on each screen, a clumsy and unintuitive solution. Menus: Publishers want an uncluttered interface design, so they hide the menu buttons, and they all do it differently. Some make you tap anywhere on screen, others use more obscure tricks. Worst so far is Bonnier, introducing a totally incomprehensible two-finger vertical swipe from the bottom to reveal the menu buttons. Sorry guys, I think the only way is to have small, constantly visible, easy to interpret menu buttons. I don’t mind downloading utility apps, but when I want media content, I want it immediately. The current crop of iPad media apps weighs in at 150-500 Mb, which takes a loooong time to download. I just bought Wired’s July issue at 375 Mb, it took 25 minutes to download. 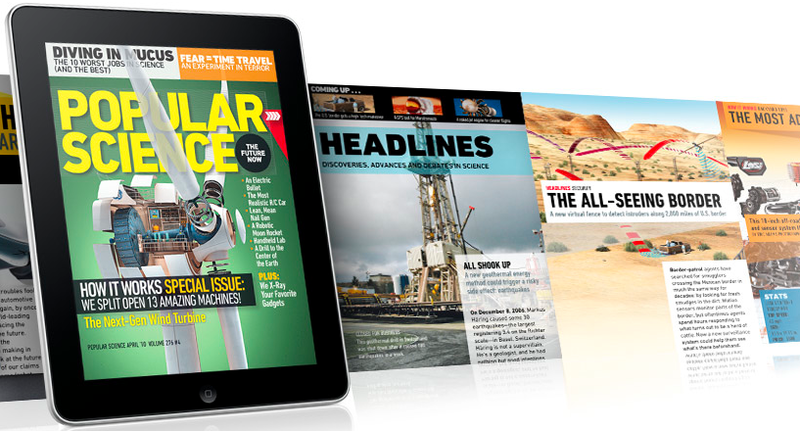 Bonnier’s Popular Science July issue, 147 Mb, 51 minutes to download! Both of these magazines’ web sites load in about a second… This is somewhat like comparing apples and oranges, sine their websites don’t contain the same content, but the user experiences the app download as a pain that does not exist on the web. Since users are still so reluctant to pay for online content in a web browser, apps will continue to grow for some time. The second generation of apps will soon be connected and solve most of the problems described above. Meanwhile, HTML5 and other emerging web standards and tools will enable publishers to improve media sites with smarter interfaces and functionality. In this process they will experiment with new types of online revenue models, (see my post “Experiment or die“). This will also eliminate the problems of adapting your content to multiple mobile platforms like iOS and Android. Eventually this will to a large degree replace downloaded apps, but it will take a few years. The key here to media publishers is that they have to be more innovative and develop smarter interfaces and functionality that all the other free online media sites cannot offer. The best way to find out what will work best is to be innovative, start experimenting with all sorts of solutions. I am convinced that the development pace will be very fast in the next couple of years and look forward to enjoying media like never before. Very well written post on an interesting subject. I agree with most what you write, but I think there are really no turning back in terms that at least the basic subscription needs to be free. As you write, personalization and true added extra value is the only way to increase the willingness to paying. You know, I’m thinking the entire format for digital magazines need a real remake. No online magazine can today compete with my Twitter feed where I have chosen who to trust, get information from, sometimes even real time from several different independent voices, in the subjects that interests me. A few filters and it’s complete. Of course the links often goes to magazine content – articles – I’m not saying they’re not needed, but they probably need to rethink the format to get it working with ads or revenues.